I’m happy to say we survived the epic flooding in Ft. Myers. I’ve never seen rain come so fast and so hard. But, as fast as it came, it went. The sun came back out and we found ourselves high and dry, safe and secure. 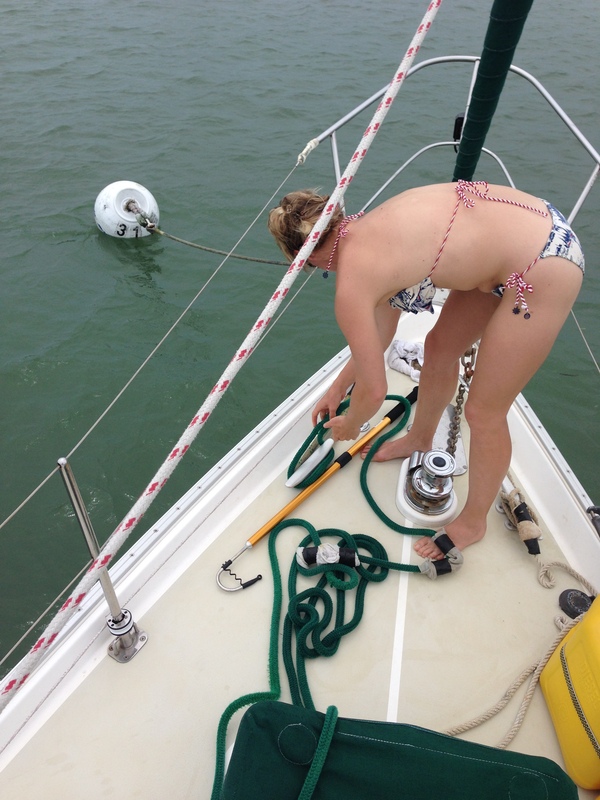 Which meant it was time to do what we normally do right when drop anchor (or snag a mooring ball). That’s right … make a cocktail! Or three. Now, typically I would have snapped a few shots of us mixing our drinks, toasting the sunset, smiling like happy sailors, but if you recall, after our horrendous night in the Gulf, the harrowing entry into Charlotte Harbor under nightfall and the approximate one hour nap we had that morning, we … were … beat. That silly little selfie above is all the photo-taking I could muster for the evening. It was the last shot of the day. And, I believe it was somewhere in the middle of his second rum drink that the Captain started to nod off and dip his head into his glass. I can’t blame him. 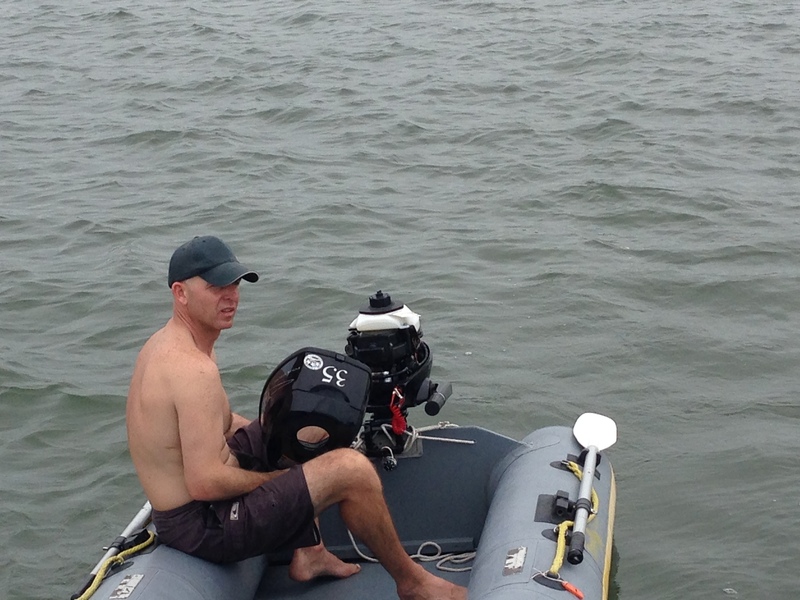 The man had held the helm of our beloved boat for about 12 hours straight. 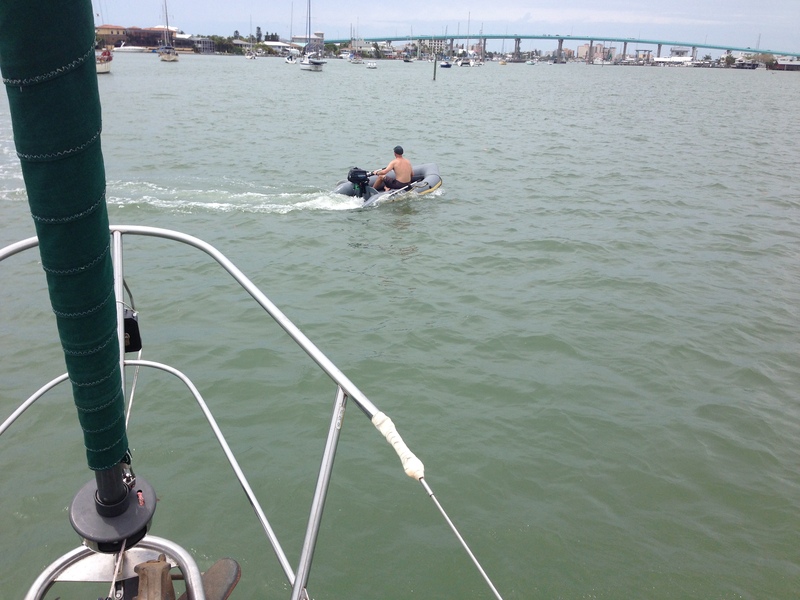 And, then motored us all the way over to Ft. Myers in the same day. It was around 6:00 p.m. and we were both fading fast. Phillip kicked back on the settee to “close his eyes for just a minute” while I threw some dinner together – one of our go-to’s on the boat – chicken tiki masala with naan. The funny thing was, though, I was banging around, clanging pots, opening cabinets, shutting doors, doing a great number of things any one of which would usually have the Captain sitting upright, looking around, but none of it phased him. He was OUT. Gone, done for. Knee deep in REMs. I roused him for supper and watched with a wicked grin as his head bobbed and wobbled above his plate and he shoved clumsy mouthfuls in, barely taking the time to chew before swallowing. His entire plate was gone in under six minutes, and he was back in a deep sleep within the seventh. I have to admit it was pretty entertaining. I have never seen him that tired. We both fell asleep around 6:45 p.m. and slept till about 8 the next morning. It was glorious. Now, did we wake to a sticky, caked-up tiki masala mess? Sure! But it was totally worth it. We woke slowly, took our time sipping coffee and reading and just absorbing the morning. 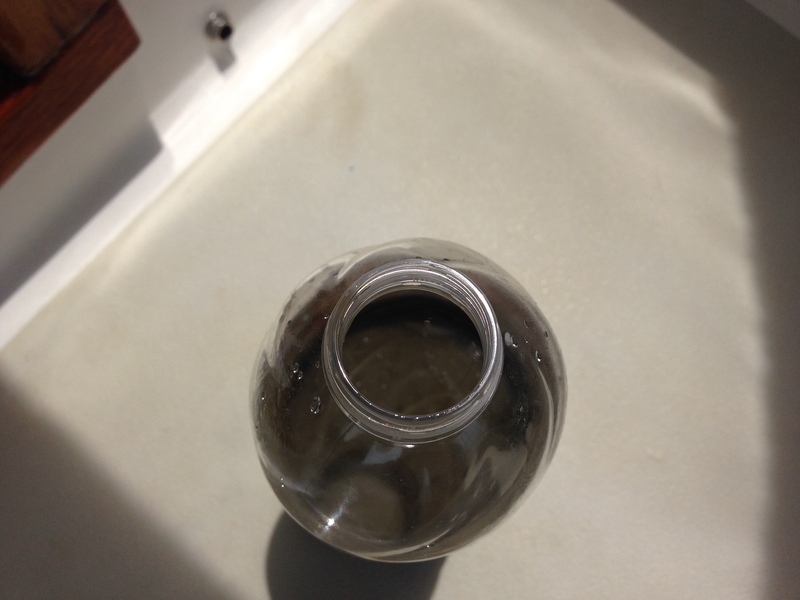 One thing we had noticed intermittently during the night – although it didn’t really phase us, was that our mooring ball kept going underneath the boat and scraping loudly from one side of the hull to the other. 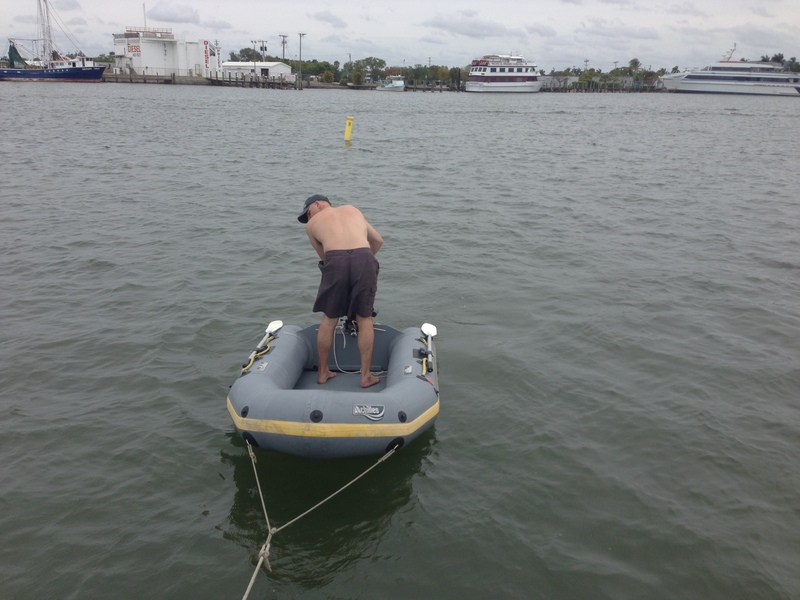 The balls at the Ft. Myers mooring field were rather large and ours made a raucous sound every time it trudged its way from one side of the boat to the other. 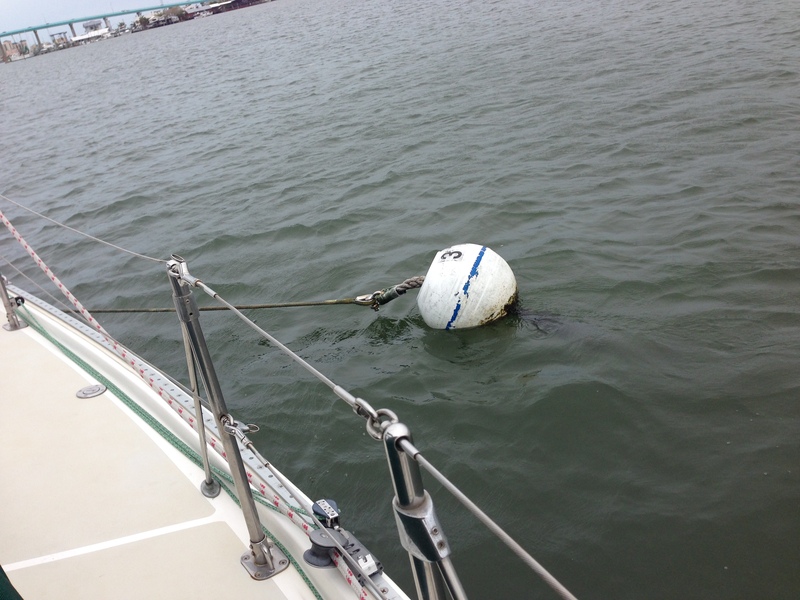 Now, usually the boat pulls away from the mooring ball because of the wind, so the ball going under the boat is normally not an issue, but the current in the mooring field was strong and it kept pushing our boat up over the ball. The Plaintiff’s Rest was literally on the ball. But, as we started to look around at the other boats in the field, we noticed that unlike us, they had connected the line on the ball directly to their bow cleat. We had used our dock line to make a bridal which we connected to the ball, but that certainly gave the mooring ball a lot more room to play with. So, we decided to take a cue from our fellow moorers, nix the dock line and just tie the ball directly up to our boat. Then the ball was too close to the the bow to make its way up under the hull. Problem solved. On to the next! While we didn’t anticipate one, as it seems is always the case in boating, we certainly got one. 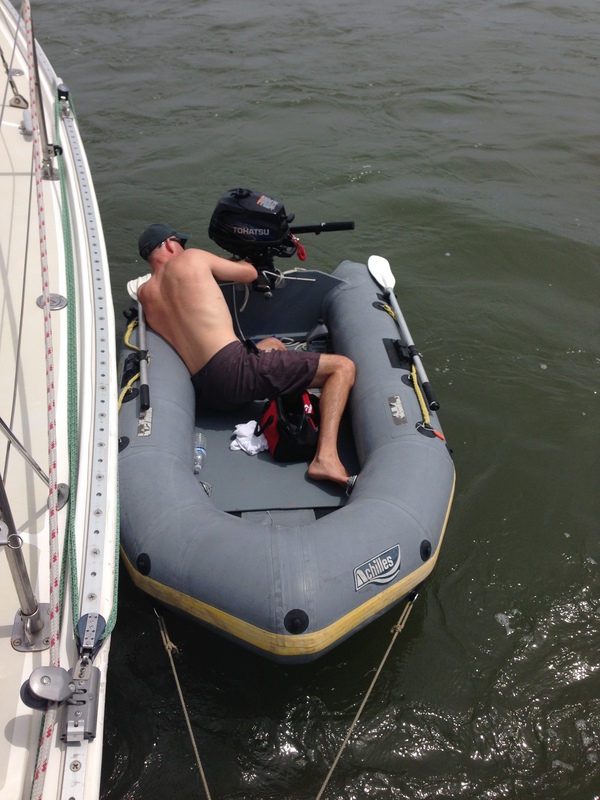 We had big plans that morning to dinghy to shore, go exploring, get some lunch, check out the facilities. You know – get the lay of our new “land.” But, unfortunately, when we decided to leave the “house” that morning, the “car” wouldn’t start. So, Phillip set to it. He cranked and pulled and yanked and cursed that thing – for half an hour at least. I laughed and took pictures. 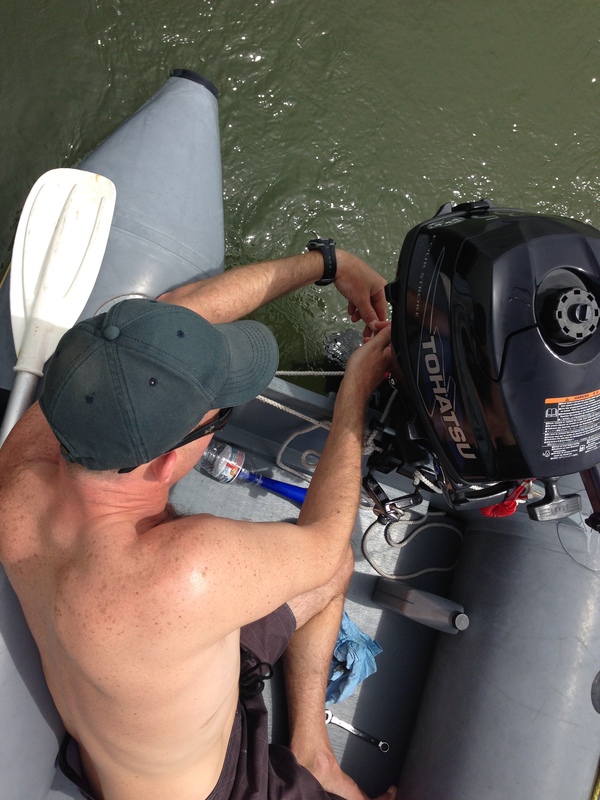 Then we decided to really troubleshoot it. 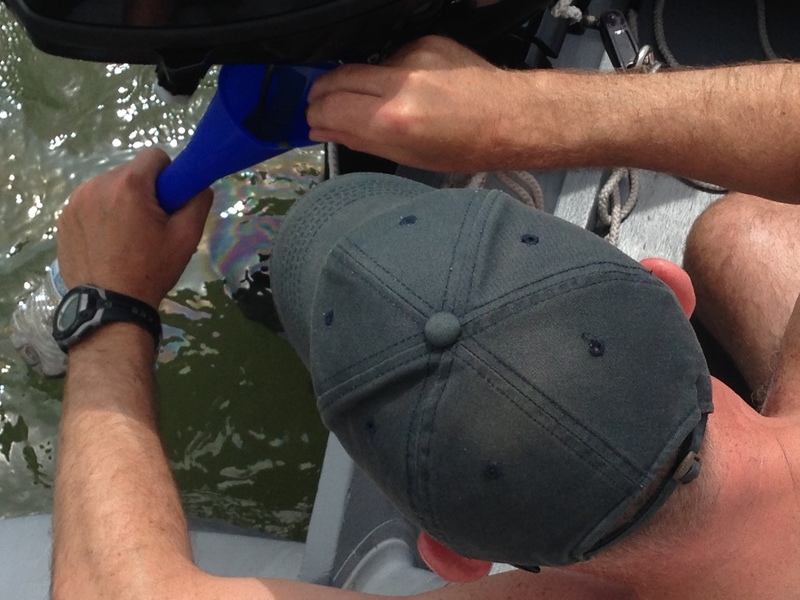 When Phillip looked in the oil window, he could see the oil in the outboard was murky, which meant it had probably taken on water, somehow, during our horrendous night. To this day we are still not sure exactly how that happened. But, c’est la vie. So, he changed the oil in it. And, boy was he right. It was murky. 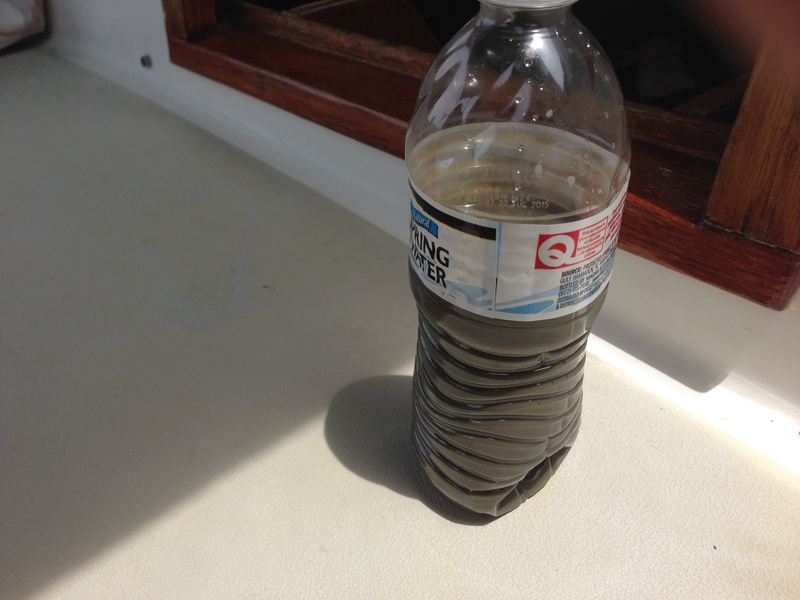 The oil almost looked like chocolate milk. He ended up changing it three times before it began to look like oil again. Then he tried to crank her again. She would sputter and fire and run for a bit and then die. So, he would crank her again. She would sputter and fire and run for a bit and then die. So, he would crank her again, and so on. What was I doing, you ask? Laughing and taking video of course! I mean, it wasn’t really comical, but what else are you going to do? 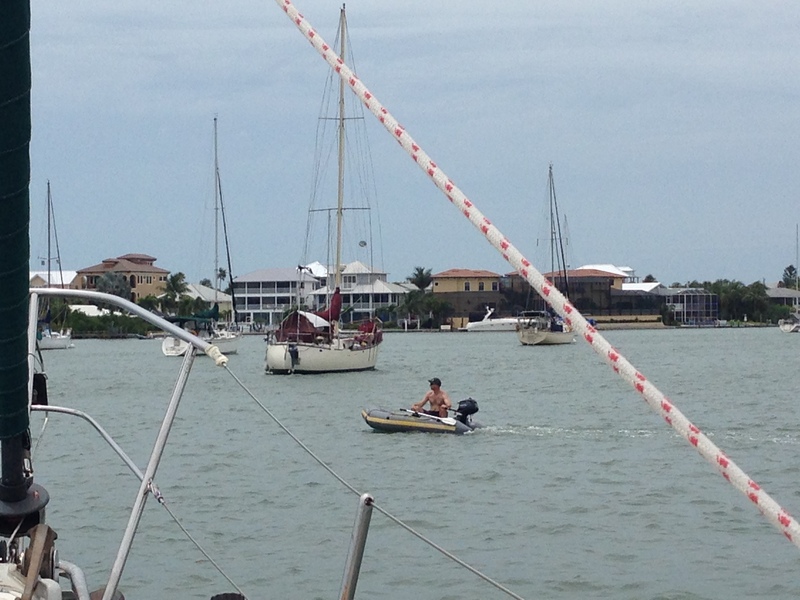 The great thing was, all of our boat neighbors started to get in on the action. They had been watching Phillip jack around with that engine for about two hours now, listening to her crank and die, crank and die, crank and die. Several of them would throw their arms up and cheer when she cranked and heckle her when she died. “Booo! !” It was better than football. 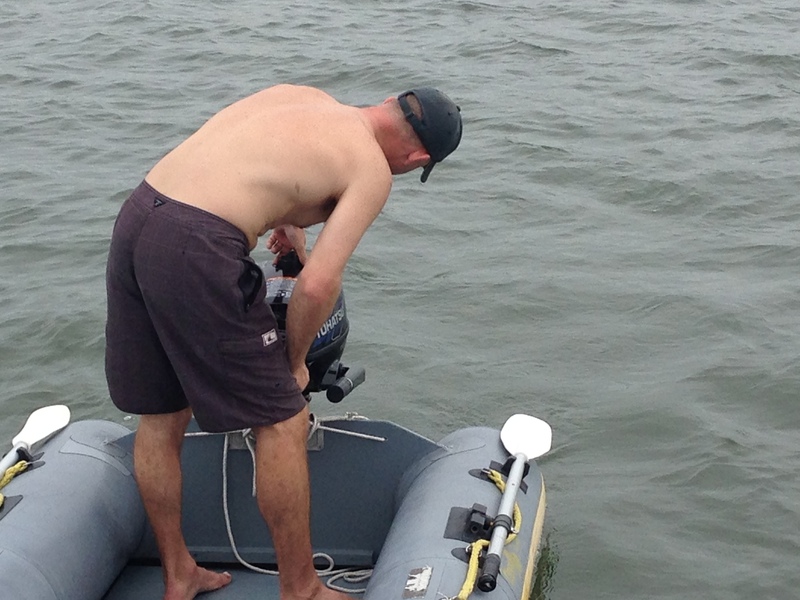 And, when the outboard would crank and Phillip would get going a bit, other boaters would circle the wagons and check on him to make sure he didn’t get stranded. 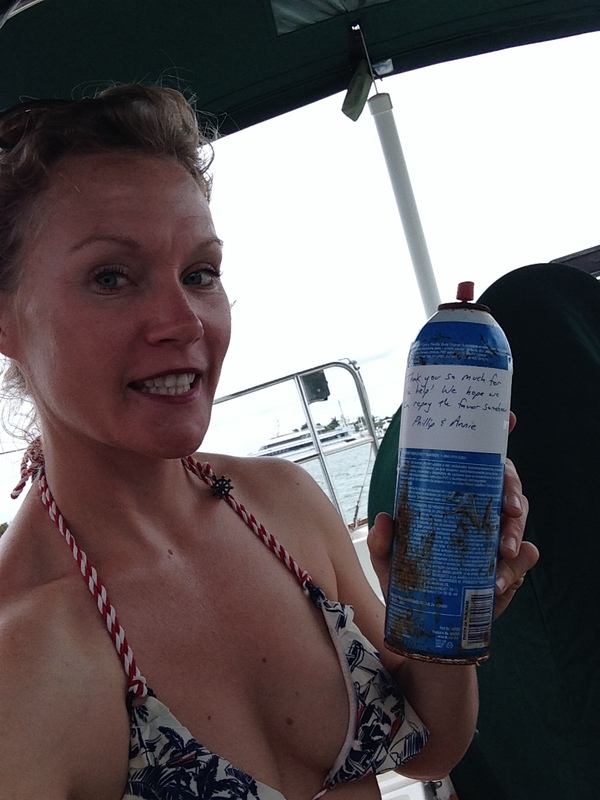 We even had some folks swing by and drop off what they called their “magic juice” – some special lube they always spray on their outboard when she gives them fits. 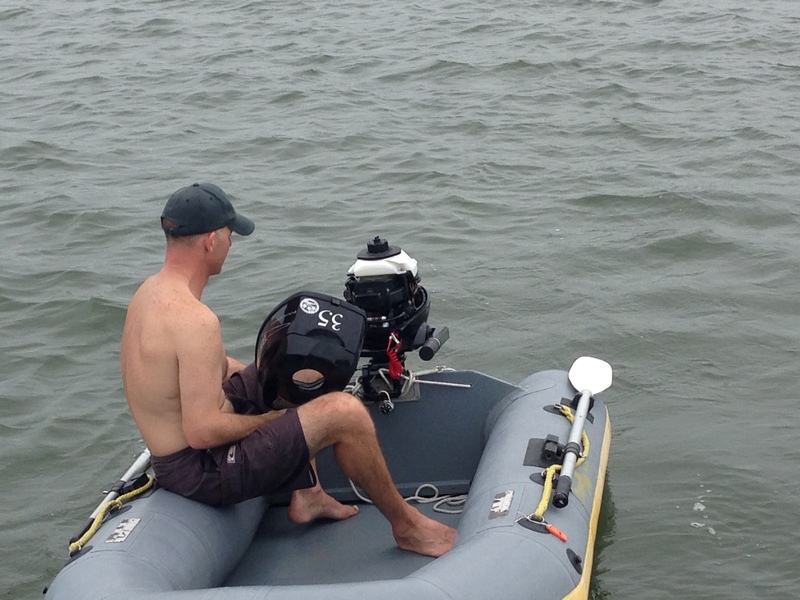 Because everyone’s outboard gives them fits. It should just say in the manual: SOMETIMES SHE WILL CRANK, SOMETIMES SHE WILL NOT, AND THERE’S NO REASON WHY. That would at least squander the hope that she’s going to run like she’s supposed to. But, the Captain was persistent. He stuck with it and finally got her purring. Then he started zipping around all over the field, lavishing in the cheers and hollers building around him – the roar of the crowd! Haaahhhahaaa. It was hilarious. 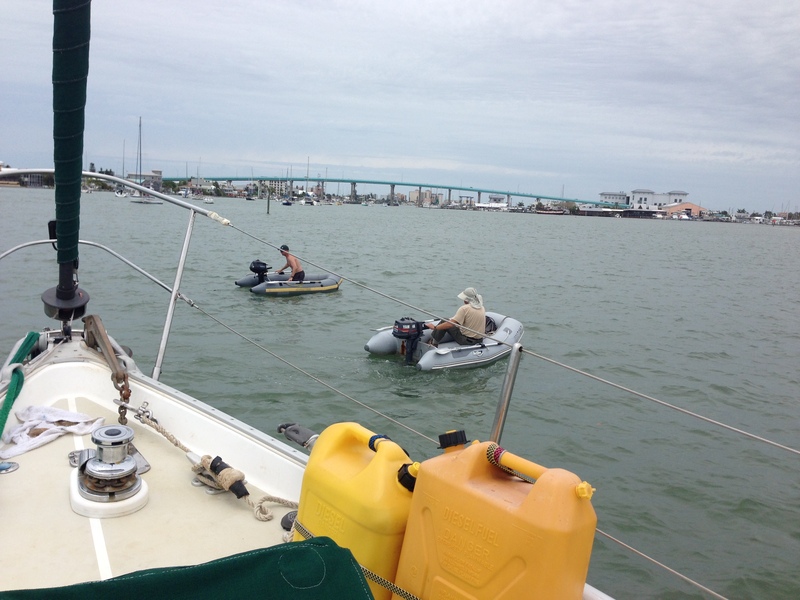 We packed that puppy up while she was running and made our way to shore! 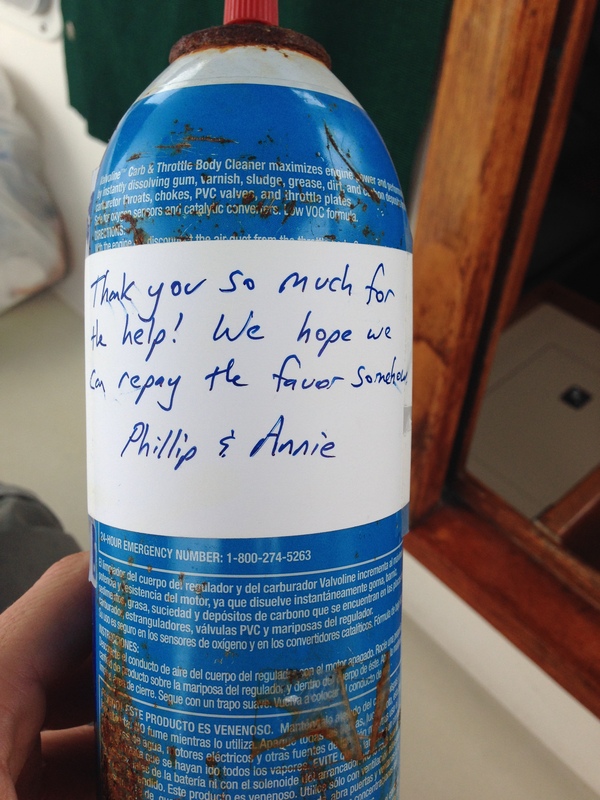 We stuck a little thank-you note to the “magic juice” can and dropped it off on our neighbors’ boat. Finally the car had cranked and we were on our way. To Ft. Myers Beach baby! It’s time for a margarita! 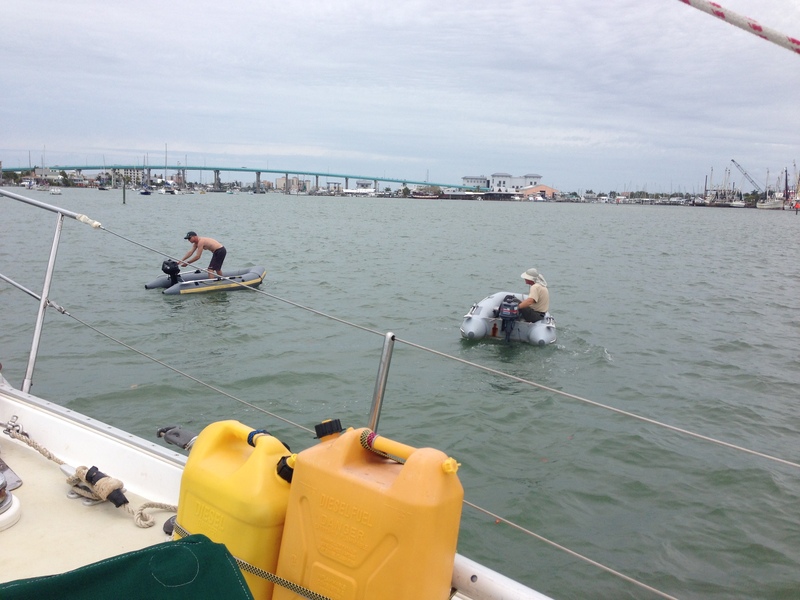 This entry was posted in Boat Projects, Cruise to the Keys 2014, Engine Issues and tagged changing outboard engine oil, chicken tiki masala, cruise to the florida keys, ft. myers beach, ft. myers mooring field, gulf crossing, outboard engine. Bookmark the permalink. Off topic, but I think I found the next hobby you two can pursue when you tire of kite boarding. There’s bound to be some good blog posts in mastering that sport. Ha! As crazy as kite-boarding may appear, that looks absolutely insane! Thanks for sharing. Good luck with selling the “dreams”. Cheers! Thanks. Eagle was under contract four days after the ad hit Yachtworld. We’re waiting for the buyer to arrange the survey now. Provided there are no issues discovered (we aren’t anticipating any), she’ll be in the hands of her new owners in the new couple of weeks. Famous last words … I’m kidding. Congrats. You sure are lucky. 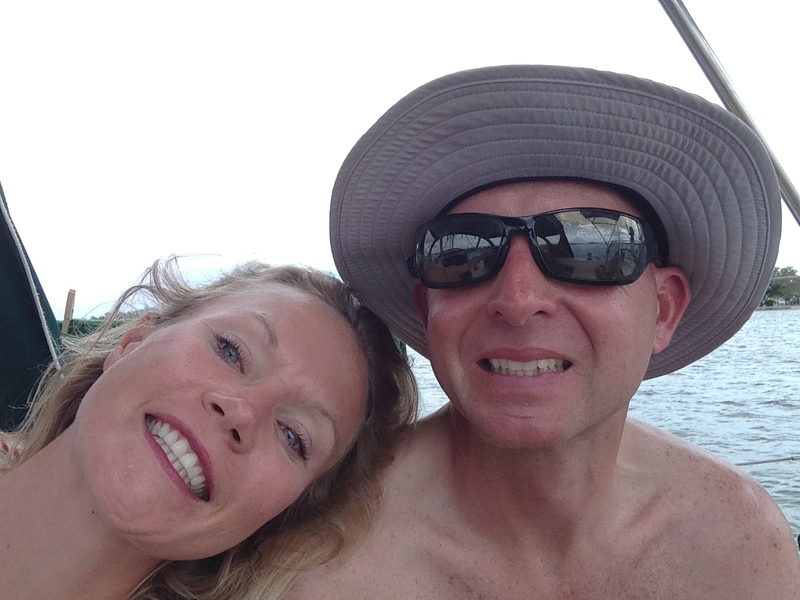 The only thing more stressful than owning a boat during hurricane season is owning two! Ha. Kudos. I’m loving you narrative. You should have been an author …it was a dark and stormy night. Sorry u didn’t make it was Friday. What a hoot have about 1in on my phone so I’ll show you on a ski trip. Waiting for your call to go sailing. Oh you r beautiful ! Wow, El. Thank you SOOOO much. I’m so glad you’re enjoying the blog. We certainly never fail to have a good time. And – writing – that is the ultimate goal. We’ll see if I can’t cobble that blog into a book someday. Sorry I missed the solstice. We always seem to be on the go. But – thrilled to hear about your new beau. Phillip said you tell us a date and time and we’ll get you and your new man out on that boat!! Till then. Cheers!